Most northerly of the Ionian Islands. 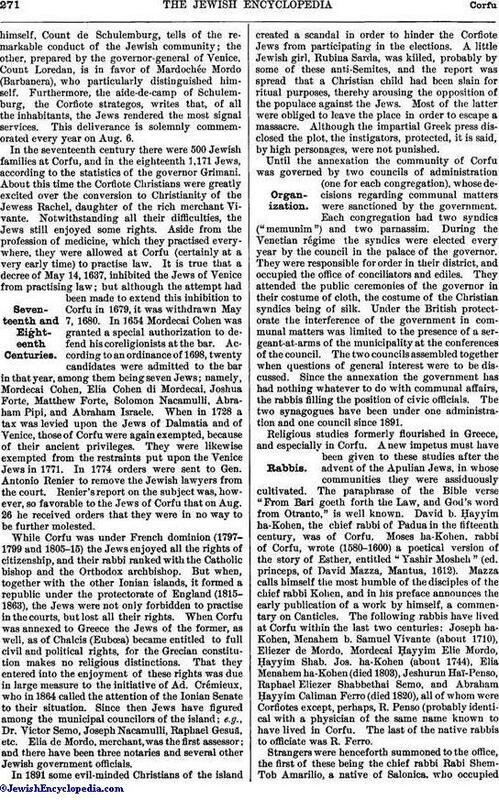 The native Jews of Corfu fall into three distinct divisions of different origin (Greek, Spanish, and Apulian) and belonging to different epochs. There was formerly also a fourth division, that of the Levantines, the greater part of whom apparently became merged into the Italians. Composed of Jews who came from Thebes toward the end of the twelfth and in the thirteenth century. Benjamin of Tudela, visiting the island in 1147, found only one coreligionist, the dyer Joseph. A large number of Jews came to establish themselves on the island after it had passed from Byzantine dominion to that of the Angevin kings of Naples. Many documents show that there were Jews in Corfu in the thirteenth century, having been carried thither as prisoners by King Roger of Sicily, who conquered Thebes (in Bœotia) and Corfu about 1150, or having voluntarily migrated from Thebes, and perhaps also from Sicily. King Roger had previously sent Theban Jews to the island for the purpose of introducing sericulture, Sicily being at that time under Angevin kings, who favored the Jews. A proof of the Theban origin of the Jews of Corfu is found in the word σίδα ("pomegranate"), from the ancient dialect of Thebes, a word used only by them, though their dialect is the Apulian. The Greek Jews (who called themselves "Toshebim" or "Terrieri") differ from the other Jews on the island by various customs—e.g., they celebrate the additional day of Purim (Shushan Purim; see Esth. ix. 18), while the Jews belonging to the Apulian synagogue celebrate only the first day. The former observe on the first day only the religious ceremony at the Temple and the small banquet, reserving the masquerading, the ball, and the grand banquet for Shushan Purim. They have also preserved Greek elegies for the Ninth of Ab (see specimens in "Israelite Chronographos," No. 2, Corfu, July, 1899), and until recently a Greek chant was recited in their synagogue on the day of Pentecost. The first complete Biblical text in modern Greek is a translation of Jonah (twelfth century) made for the Jews of Corfu. The Greek synagogue is the oldest on the island. Until recently it differed somewhat from the others in its liturgy, and the ministers officiating in Greek still preserve that nasal chant peculiar to the Greco-Oriental preachers. 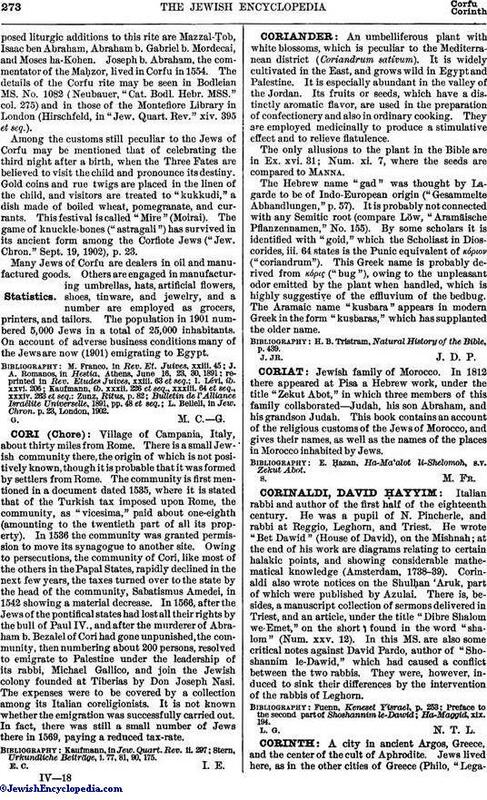 The Greek Jews, who were absorbed by the more numerous Apulians, forgot their language, but have retained characteristic words and phrases. Their family names are, or have been, Gesuã, Eliezer, Belleli, Moustaki, Naxon, De Semo, Mazza, Pangali, and Abdalá. At present they possess not only their own synagogue, but also their own burial-ground, called "the Greek cemetery." Composed of Spanish Jews who had lived for a time in the Two Sicilies, and who emigrated to Corfu at the end of the fifteenth and during the sixteenth century; among their number was Don Isaac Abrabanel. 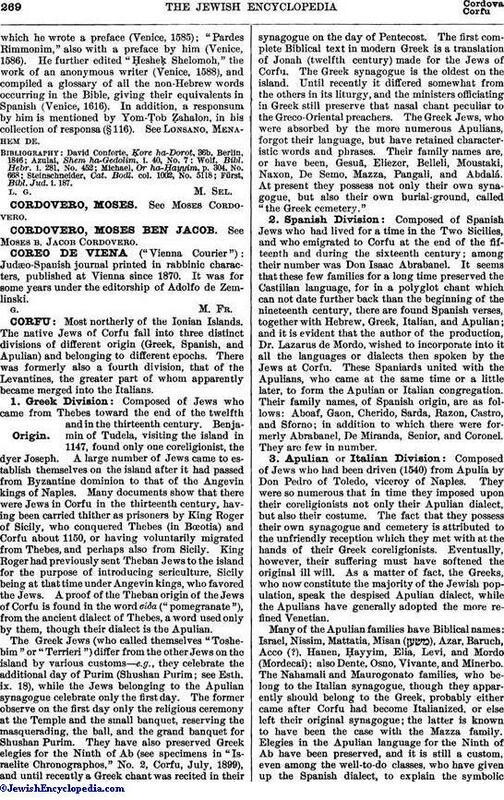 It seems that these few families for a long time preserved the Castilian language, for in a polyglot chant which can not date further back than the beginning of the nineteenth century, there are found Spanish verses, together with Hebrew, Greek, Italian, and Apulian; and it is evident that the author of the production, Dr. Lazarus de Mordo, wished to incorporate into it all the languages or dialects then spoken by the Jews at Corfu. These Spaniards united with the Apulians, who came at the same time or a little later, to form the Apulian or Italian congregation. Their family names, of Spanish origin, are as follows: Aboaf, Gaon, Cherido, Sarda, Razon, Castro, and Sforno; in addition to which there were formerly Abrabanel, De Miranda, Senior, and Coronel. They are few in number. Many of the Apulian families have Biblical names: Israel, Nissim, Mattatia, Misan ( ), Azar, Baruch, Acco (? ), Hanen, Ḥayyim, Elia, Levi, and Mordo (Mordecai); also Dente, Osno, Vivante, and Minerbo. 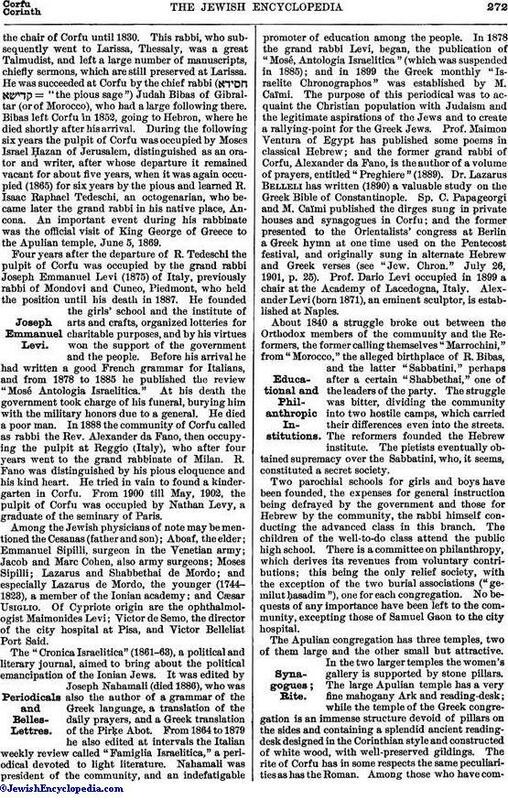 The Nahamali and Maurogonato families, who belong to the Italian synagogue, though they apparently should belong to the Greek, probably either came after Corfu had become Italianized, or else left their original synagogue; the latter is known to have been the case with the Mazza family. Elegies in the Apulian language for the Ninth of Ab have been preserved, and it is still a custom, even among the well-to-do classes, who have given up the Spanish dialect, to explain the symbolicrites in Apulian ("ḳadesh," "u-reḥoẓ," "karpas," etc.) on Passover eve. The population, which to-day (1901) exceeds 3,000 souls, numbered 1,171 in 1760. The larger number of Jews followed some handicraft, and the rich ones were engaged in commerce, acquiring great wealth. They were devoted to their country, fighting for it and giving freely of their money, as may be seen from the written testimonials they obtained from the Venetian governors when the latter laid down their office and left the island. In 1431 they lent the Venetian Senate 3,000 ducats. In the seventeenth century they aided the Venetian armies with money during the disastrous wars with Crete and the Peloponnesus. But in 1656 the captain of the island levied a tax of 10,000 reals upon them, though they had declared themselves ready to pay 500 ducats a year for military purposes. The Jews protested, and on Oct. 25 the Senate ordered the money to be returned. In 1716 they bravely assisted in defending the island of Corfu against the Turks. Two documents testifying to their exceptional heroism are extant. One of these, written by the Venetian generalissimohimself, Count de Schulemburg, tells of the remarkable conduct of the Jewish community; the other, prepared by the governor-general of Venice, Count Loredan, is in favor of Mardochée Mordo (Barbanera), who particularly distinguished himself. Furthermore, the aide-de-camp of Schulemburg, the Corfiote strategos, writes that, of all the inhabitants, the Jews rendered the most signal services. This deliverance is solemnly commemorated every year on Aug. 6. Strangers were henceforth summoned to the office, the first of these being the chief rabbi Rabi Shem-Ṭob Amarilio, a native of Salonica, who occupiedthe chair of Corfu until 1830. This rabbi, who subsequently went to Larissa, Thessaly, was a great Talmudist, and left a large number of manuscripts, chiefly sermons, which are still preserved at Larissa. He was succeeded at Corfu by the chief rabbi ( = "the pious sage") Judah Bibas of Gibraltar (or of Morocco), who had a large following there. Bibas left Corfu in 1852, going to Hebron, where he died shortly after his arrival. During the following six years the pulpit of Corfu was occupied by Moses Israel Ḥazan of Jerusalem, distinguished as an orator and writer, after whose departure it remained vacant for about five years, when it was again occupied (1865) for six years by the pious and learned R. Isaac Raphael Tedeschi, an octogenarian, who became later the grand rabbi in his native place, Ancona. 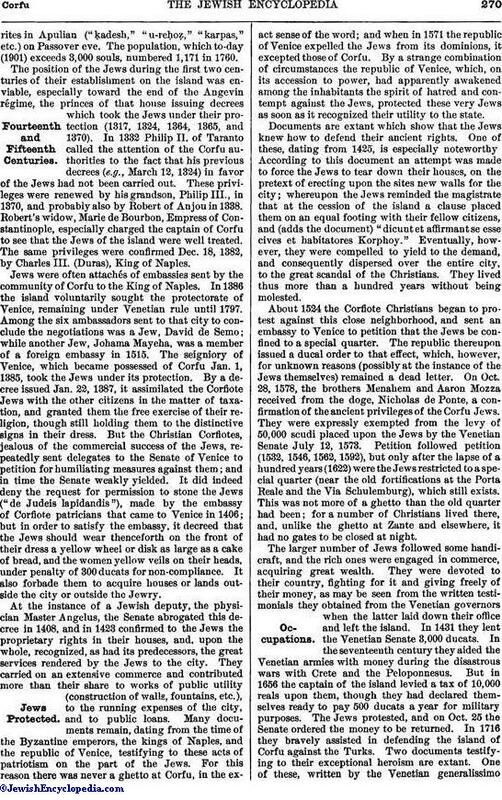 An important event during his rabbinate was the official visit of King George of Greece to the Apulian temple, June 5, 1869. The Apulian congregation has three temples, two of them large and the other small but attractive. In the two larger temples the women's gallery is supported by stone pillars. The large Apulian temple has a very fine mahogany Ark and reading-desk; while the temple of the Greek congregation is an immense structure devoid of pillars on the sides and containing a splendid ancient reading-desk designed in the Corinthian style and constructed of white wood, with well-preserved gildings. The rite of Corfu has in some respects the same peculiarities as has the Roman. Among those who have composedliturgic additions to this rite are Mazzal-Ṭob, Isaac ben Abraham, Abraham b. Gabriel b. Mordecai, and Moses ha-Kohen. Joseph b. Abraham, the commentator of the Maḥzor, lived in Corfu in 1554. The details of the Corfu rite may be seen in Bodleian MS. No. 1082 (Neubauer, "Cat. Bodl. Hebr. MSS." col. 275) and in those of the Montefiore Library in London (Hirschfeld, in "Jew. Quart. Rev." xiv. 395 et seq.). L. Belleli, in Jew. Chron. p. 23, London, 1902.